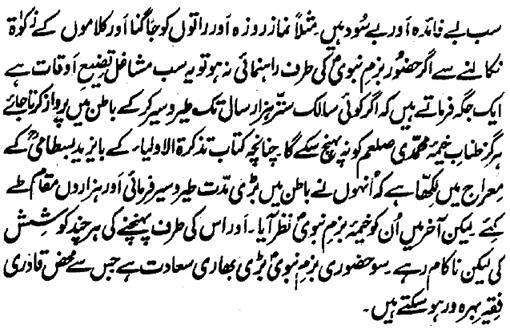 In his books, Hazrat Sultan Bahu Rahmatu-Allahe Ta-aala Alaihe has declared the continual Hazoori in the Luminous Majlis and the Esteemed Court of the Holy Prophet Sal Allahu Alaihe Wa Aa-lehee Wa-sallam the Entirety of all the Destinations of the Salook and the Extremity of the entire Inwardly Stations and has said that all the Destinations and Degrees including the Teer-Sair of seven heavens and the Arsh and Kursi are like a ladder and staircase to the Station of Hazoor and those worships and obedience and the exercise of preoccupation of Zikr and Fikr, through which the Course of Hazoor does not open, those are all vain and useless. For example, Assalaat (Prayers), Fasts, keeping vigil (the night long) and paying Zakaat of the Words of Revelation are all wastage of time if these things do not lead a person towards the Congregation of the Holy Prophet Sal Allahu Alaihe Wa Aa-lehee Wa-sallam . In a book, he says that a Saalik cannot reach near the rope of the Tent of Muhammad Sal Allahu Alaihe Wa Aa-lehee Wa-sallam even if he flies in the Inward for seventy years in Teer-Sair . 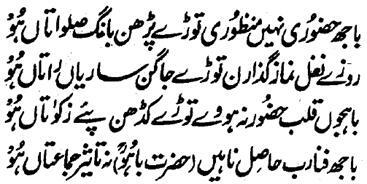 Hence, in the Tazkira Tul Aulia, about the Ascendance of Hazrat Bayazid Bastami , it has been written that he did Teer-Sair in the Inward for a long time and covered thousands of Stations and then at the end, he saw the Tent of the Majlis of the Holy Prophet and he tried hard to approach near it but could not! Hence, the Majlis of the Holy Prophet Sal Allahu Alaihe Wa Aa-lehee Wa-sallam is very auspicious welfare with which only the Qadiri Seekers are endowed with.